The ActiveWave Handheld Reader is a small, lightweight Reader used to find tagged items quickly and conveniently. The Handheld Reader fits comfortably in the palm of your hand. Users carry this portable Reader while looking for specific items such as merchandise, inventory, or other assets. For example, to find a specific crate in an aisle full of inventory, the user just enters the crate's tag ID in the Reader, then selects Call. The Reader will indicate that the tag is found. Optionally, the tag can either beep or blink an LED to help locate it. In addition, the RF range of the Handheld Reader is easily adjustable, so the size of the search area can be controlled. The signal strength of the tag's response (RSSI) is measured and diplayed to the user, thus giving the user an idea of how far away the tag is located. The Handheld Reader can also be used to manually scan and program individual tags. Instead of reading all tags in an area at one time, users can selectively read and program only particular items. A barcode scanner is a standard part of the Handheld Reader. With it, users can quickly scan a barcode label, then write this same information to an adjacent RFID tag. This feature can save users tremendous time when transitioning from old barcode systems to new active RFID systems. 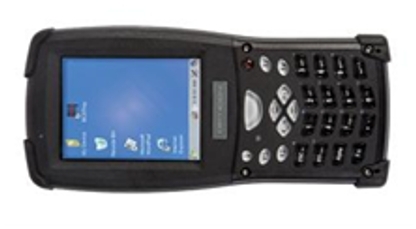 To download tag data to a Host computer, the Handheld Reader uses RS-232, RS-485 (in cradle), or infrared for wireless communications. RFID Tag Read / Write Range - external antennas 30m (100ft) / 15m (50ft). These ranges can be extended with larger antennas.